Bunratty Castle is the quintessential Irish castle, and being so closely located to Shannon Airport and the new Gort to Limerick motorway, it gets a lot of traffic, especially in high season. Yet the castle as well as the Folk Park around it are well worth a visit and with good facilities on site the visit will make for a great day out for the whole family. The castle itself is quite the thing for medieval castle buffs. You will find everything the heart desires such narrow spiral stair cases, a murdering hole, a murdering pit with spikes in it that undesired visitors could be dropped into, large halls, lavishly decorated bedrooms, and my personal obsession- garderobes or medieval toilets (no less than fourteen). 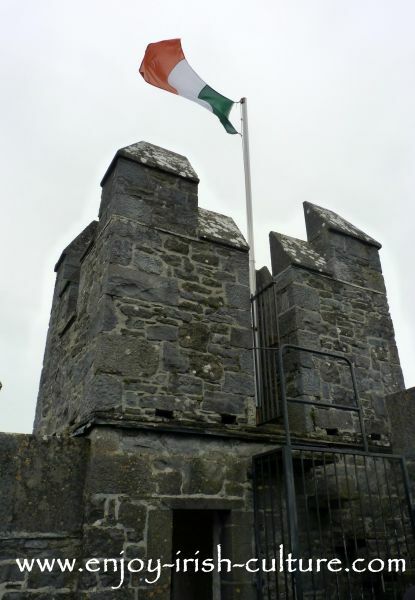 The history of the castle is typical of medieval Ireland, where local chieftains and Norman war lords were all involved in bitter, bloody conflicts. One drawback to visiting Bunratty Castle, we found, is visitor numbers. Most likely there will be a queue for the castle, and a bit of a jam on the narrow stairways. Be prepared! As well as the castle visit there is the whole folk park to explore which includes any number of old-style cottages, a big house, and an entire village full of shops and pubs that even has a post office. There is a playground which is a great help if you are planning an all day visit with the family. 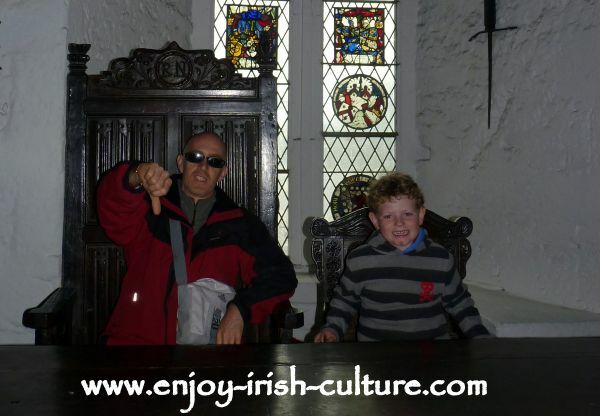 Every father and son visiting the castle that day it seemed, were doing what Colm and Cillian are doing here- sitting on the Earls' chair pretending to be in power! Bunratty Castle and Folk Park are really easy to get to. The trip from Dublin takes 2.5 hours. Take the N 7 for Limerick, which later becomes the M7. At Junction 28 stay on the M7 and bypass Limerick. At Junction 30 (Rossbrien Interchange) turn onto the N18 Limerick South Ring Road which is signposted for Shannon and Galway. Got through the Limerick Tunnel, and continue on the N 18 heading for Shannon and Galway. It’s now 20 minutes to Bunratty. Travel time from Galway City is just over an hour now with the new M 18 from Gort to Limerick. Follow signs for Gort and Ennis first, then just before the town of Gort look out for the blue motorway signs at the roundabout, and head for Limerick. From Limerick, take the N 18 which, leaving town will be signposted for Shannon Airport as well as Ennis and Galway. The trip takes under twenty minutes. Coming from either direction, the exit for Bunratty castle is well signposted, and really all you have to do is follow the signs to the car park. Opening times are daily from 9 a.m. to 5.30 p.m. and during the main season from June to august until 6 p.m. Last admission to the castle is at 4 p.m. and the folk park admission closes an hour before closing time. There are toilet facilities near the main entrance, about three gift shops with different offerings, there is a coffee shop, a restaurant, and a playground. Bunratty Folk Park also hosts other events such as circus visits which could be just the thing to round off your day. Wheelchair access: The folk park is wheelchair accessible, and the toilet facilities are, but the castle is not due to narrow hallways and stairs. An adult ticket comes in at 10.00 Euros and tickets for kids over five cost 8.00 Euros. Check out the annual membership option, too. If you are planning to visit more than one Shannon Heritage attraction it’s well worth it, and they include some special deals in the membership card. 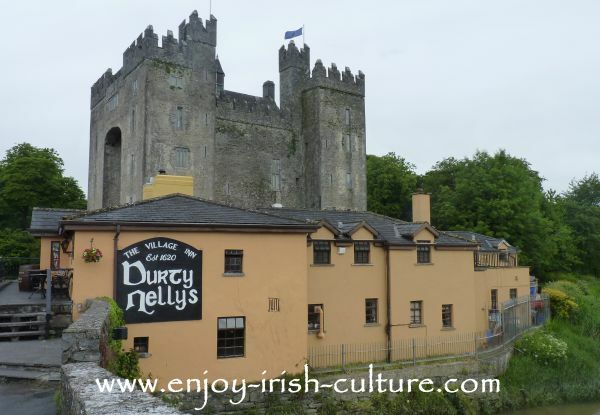 Make your visit to Bunratty an all day visit. This will work great especially if you are bringing young kids along with you. There is so much to explore. Arrive about 10 or 11 a.m. and have a relaxed day. 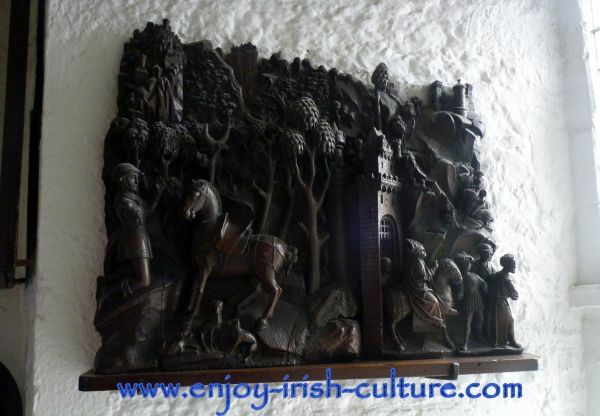 It is a great trip into Irish history and Irish culture. If there are any demonstrations going in the cottages, what better way to show the kids how butter was made in the olden days, or how to make griddle bread. The castle alone could keep you entertained for a couple of hours with all the different stairways to climb and areas to explore. For lunch, bring a picnic and buy tea/coffee at the coffee shop for the economical option, or simply use the cafe or restaurant facilities on site. This is one of the rare well-developed tourist sites where everything is laid out for you! Visitor numbers can be very high at Bunratty, especially during the summer. If you are going specifically for the castle visit because you love castles, you might consider going during the off- season between September and May. Go earlier in the day if you want the place quieter. 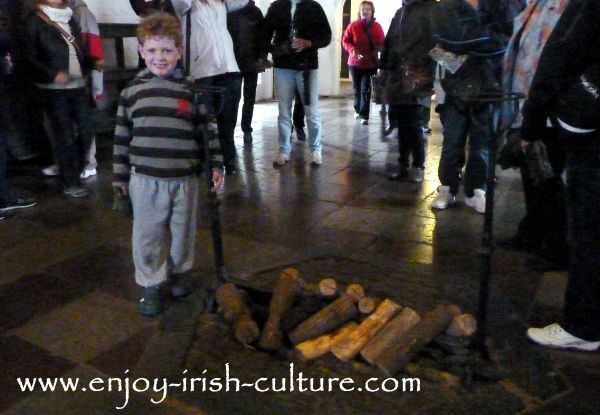 Cillian standing by the fireplace in the centre of the great hall at Bunratty, which would have once warmed visitors with the smoke escaping through a hole in the roof. If you are staying in the area, don’t miss out on another great all day excursion to Craggaunowen, a mere 15 km from here, an outdoor museum bringing you back through Irish history as far as the Stone Age. Highly recommended. 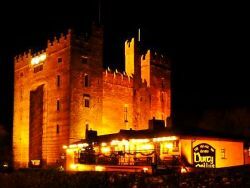 Consider a medieval banquet at Bunratty Castle where guests are entertained medieval style- ahm...not quite- medieval as in 21st century tourist friendly that is. A medieval banquet is on our list of things to do. Hi there, did you like what you saw and read on this page? We hope so! Building this website is a labour of love for us. We'd like to ask a small favour in return- would you kindly tell all your friends about us so that they, too may enjoy this content? You can do this quickly and easily using the social functions either at the top left, or at the bottom. Just pick the one you like. Many thanks, and warmest regards from Susanna and Colm!